Perhaps the most famous wine to come out of Argentina is the luscious red Malbec and this is in part thanks to Mendoza which contributes hugely to the surge in interest around all things Argentine, in particular wine and food. 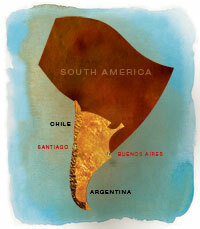 There are no hillsides in Mendoza, it is in fact, a huge high plateau at the foot of the majestic Andes. This unique location means variances in altitude and temperature (hot days and cold nights) combine to produce excellent red wine, such as their reknown Malbec and with over one thousand wineries in Mendoza, we can expect more great things in the future.